Connecting Angels Young Leader, Pamela Bang, on her first visit to Cornerstone Ranch, Bali, Cameroon. Here with co-owner, Mr Malachi Mua, learning the business of animal agriculture. We applaud our Young Leader and future entrepreneur, as well as say thank you to Mr Malachi for his mentorship of our youth. “I am a genuinely good natured, kind hearted, honest and passionate person. 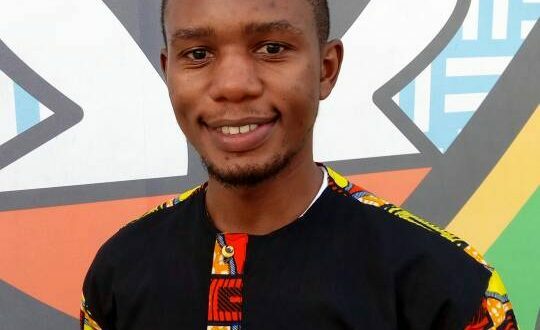 I am from the NW region of Cameroon, where I was born and raised until I was 24 yrs old, when I moved the USA, Los Angeles CA, where I currently reside. I am 28 years old, currently working on several of my own business ventures and also on projects owned by others, I’m striving for higher heights; warming up to getting into Law School. I am also an enthusiast of health and fitness, especially yoga and meditation. Connecting Angels is proud to welcome Quinta to our Young Ambassadors program 2017-2018. Quinta is a force to reckon with, giving us daily doses of health and fitness advice on her social media platform, all with a heart of gold and encouragement, a smile that brings peace to all who come near her. She embodies the Connecting Angels spirit, to just be kind, and she will be doing marvelous things for our movement in Los Angeles, California and wherever she goes. Please support Quinta in her mission to spread kindness all around the world, by creating a more peaceful world, where we take care of our health and the health of others. Minella Majenu, was born and raised in the North-West Region of Cameroon. 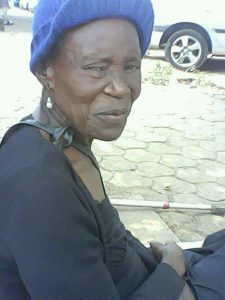 She attended St Bede’s Secondary School and St Augustine’s High School, where her deep sense of service and empathy was birthed. 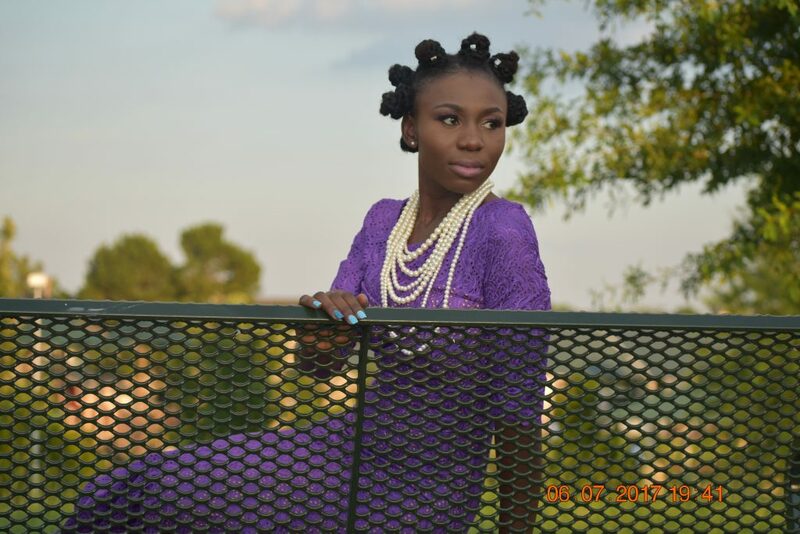 She started out as a Choir/Music prefect in Saint Bede’s and she has not stopped singing since then. Minella moved to the US after graduating from High School, to pursue a higher education. This path led to a Bachelor and Master’s Degree in Petroleum Geology from Texas A&M and University of Arkansas, respectively. She is currently pursuing a medical degree. 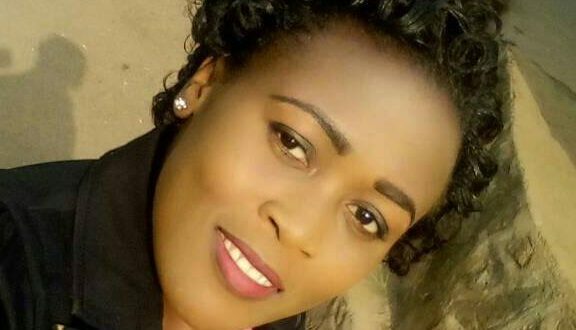 Her hobbies are: Singing (to no-one’s surprise), cooking, reading, traveling and participating in various volunteer activities at her church and local shelters. She believes education is a fundamental and basic right that should be rendered to all, especially the children – tomorrow’s leaders. 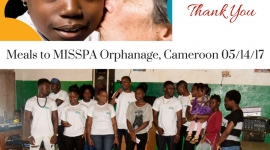 Over the last couple of years, she has been working with Hope4Children Cameroon, a US-based non-profit organization, to foster education for underprivileged children – especially girls – in the underserved rural regions of West Cameroon. 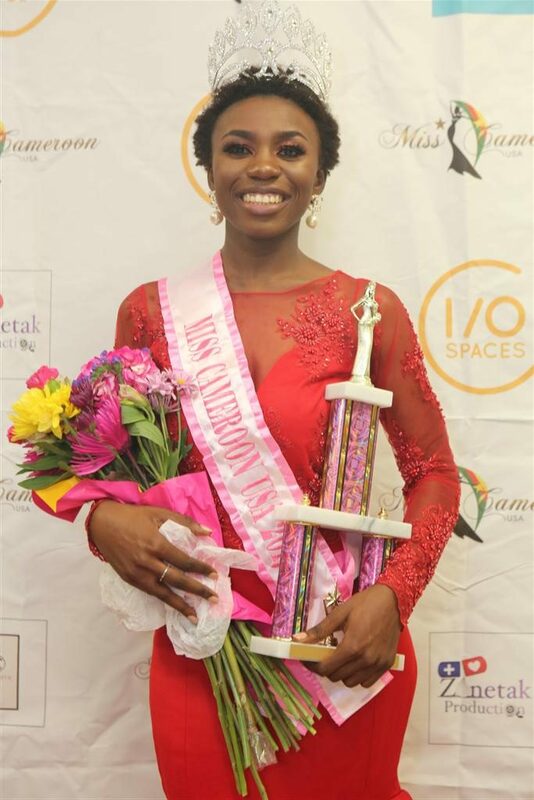 This led to her being crowned as Miss Cameroon USA 2017-2018. 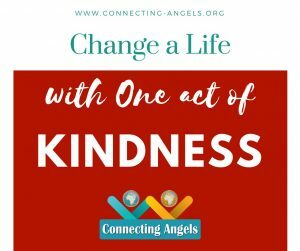 “With the same passion and empathy, I am honored to be Goodwill Ambassador for Connecting Angels. I look forward to making a difference in the lives of the under privileged and underserved, beginning with Feeding the Homeless project in Houston and beyond.” – Minella M.
Connecting Angels is proud to welcome this dynamic and intelligent young ambassador, who will champion the cause for the homeless in Houston, TX, in who, in the wake of the devastating Hurricane Harvey that left many homeless, became an even greater at-risk population. She plans to feed the homeless on the last Saturday of every month, under the Connecting Angels Pantry program. Please wish Minella well during her tenure as Ambassador, helping to create a more peaceful society through her simple act of kindness for the homeless. 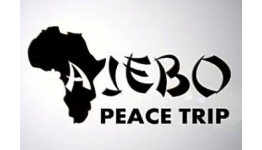 In 2016, Connecting Angels nonprofit was honored to be chosen as an affiliate of the international PEACE IS POSSIBLE campaign, launched by JCI-Junior Chambers International. 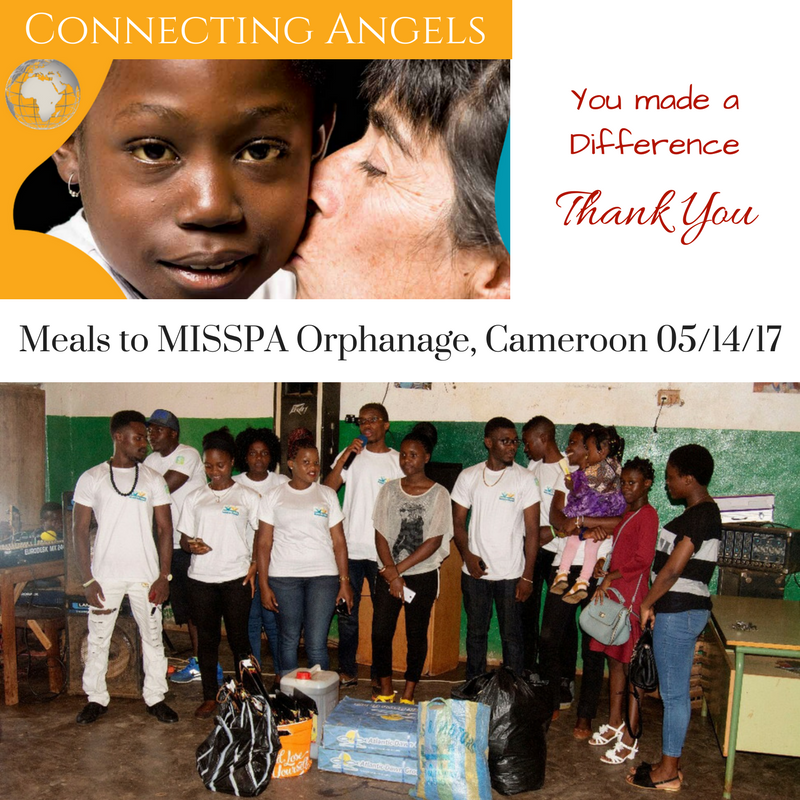 To support this mission, we launched a series of activities, to fight against hunger and take care of the underprivileged orphans in poor communities in Cameroon, Africa. unrest, the Connecting Angels team of young volunteers, got together to be a light in their local community. These Young Leaders, put their lives at risk in between ghost towns and curfews, to organize a visit to the local orphanage, and donate some food items. The orphanage, located in Mile 5 Nkwen, Bamenda, is home to about 113, ages ranging from 1-22 years. Majority were between the ages of 12 and 15, and about 70 were present on the day of donation. We presented them with gifts of two cartons of frozen fish, 20 liters of cooking oil, exercise books (donated by Switch Entertainment), pens, candies and some clothing. Connecting Angels collaborated with Switch Entertainment in visit a tremendous success. Our Connecting Angels incorporated the element of youth mentorship by involving young volunteers in the local communities. In Bamenda, our volunteers are a dynamic group, who also have needs. They lack opportunities to finish school, pay tuition, or earn a living. 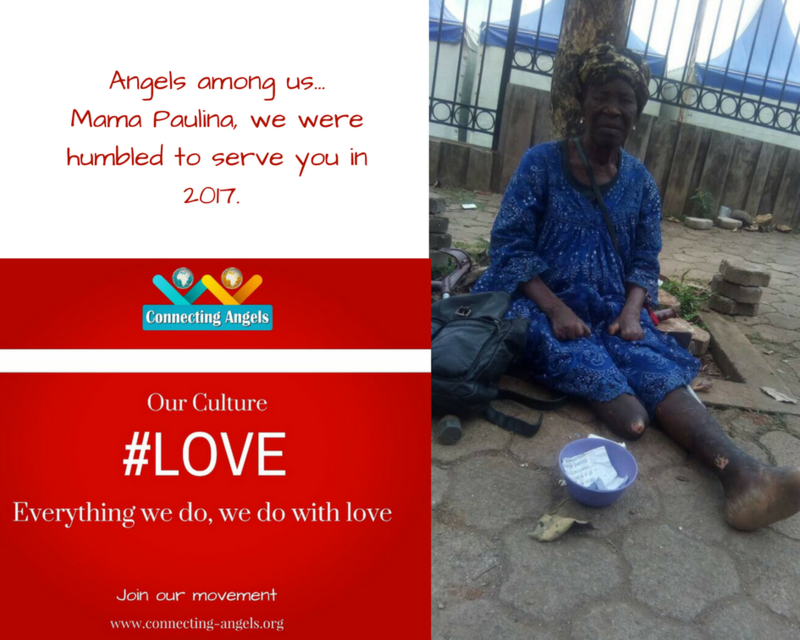 Yet, in spite of their current hardship, they took the time to uplift the children at the Orphanage on HOPE, teach them about personal hygiene, and encourage them to know that they are loved. We are so proud of our youth volunteers. 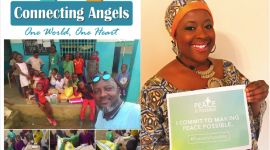 Please support their mission, and zeal by supporting the Connecting Angels peace campaign, to provide meals to orphans. Our youth volunteers are ready in different cities to carry out these visits. When you donate to our cause, you indirectly provide hope, and meaning to the volunteers as well as the orphans. Please visit our website for a detailed report on this visit. Thanks to those who have supplied goods in kind, and in cash, for distribution to shelters and individuals in need, post Hurricane Harvey destruction. Connecting Angels Inc, our Charity based in Houston, called out and you answered. 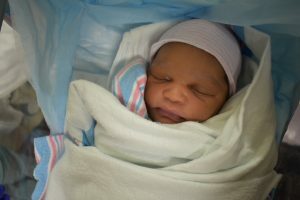 In the immediate post storm period, we asked for blankets, sheets, and food items in kind. In the past week, a couple of our volunteers and I, visited some shelters and realized that most of them, were getting all the supplies they needed from so many organizations, they actually turned our donations away. Large corporations sending in food, Pharmacies providing medications, restaurants cooking en masse and more. The only thing they needed it seems, was, actual homes to send these residents to. Realizing this, we decided to take a more focused approach, customize our help according to the changing needs. Serve smaller and less-known shelters, collaborate with small churches to find out individuals in need, and also word of mouth. Not everyone is in the shelter, but that doesn’t mean they do not need help. 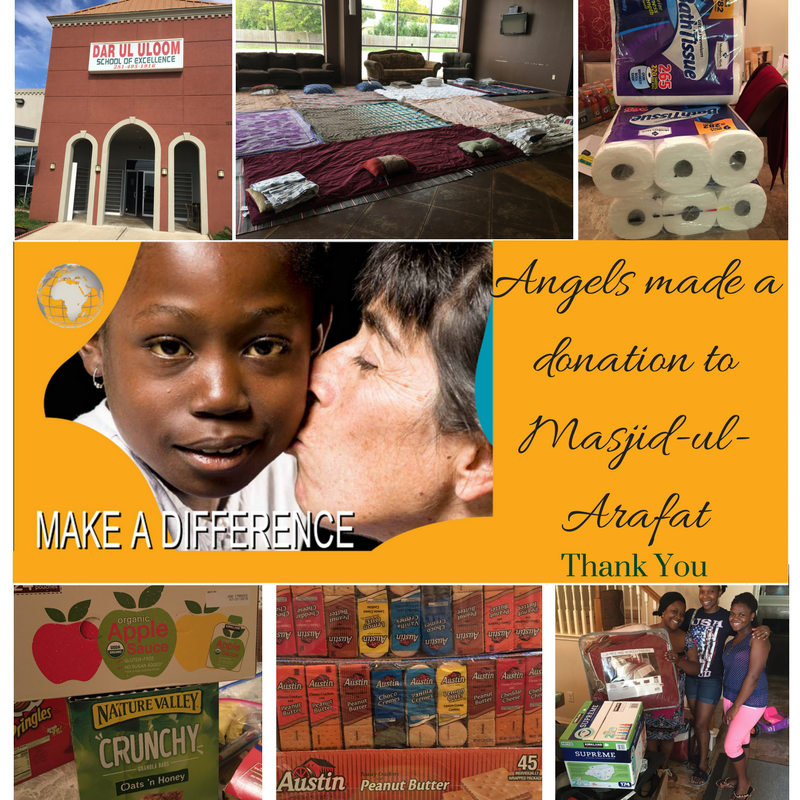 I was able, though, to personally deliver the bulk of your donations in kind to Masjid-Ul-Arafat, my neighborhood house of prayer, which had so kindly made room for those in need, no matter your creed, race or origin. I was honored to present them with some bedding, nonperishable goods, clothes, toilet paper, paper towels and cleaning detergents. 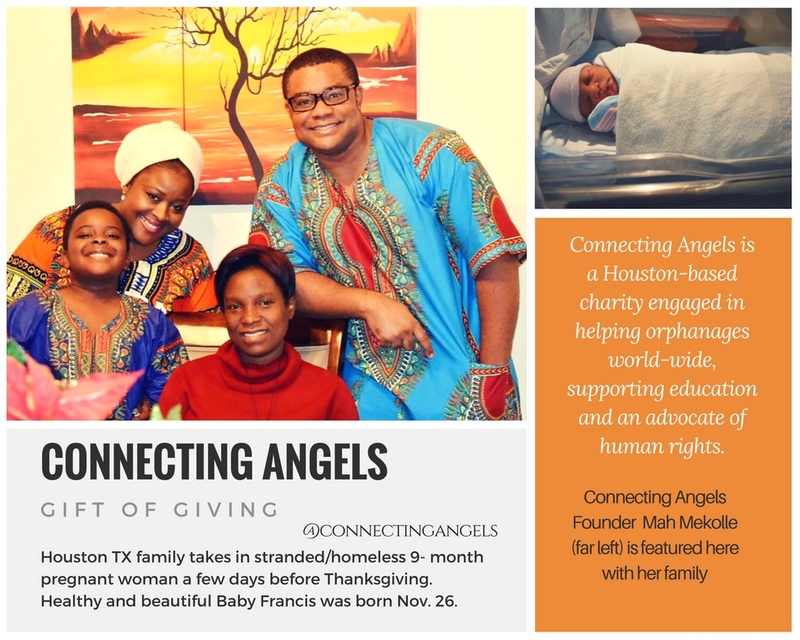 We have decided to focus on what we do best, just as our international outreach in Africa, providing meals to orphanages in Cameroon, for our relief effort in Houston, we have launched a new program, Connecting Angels Pantry. This program will collect grocery items or food items from your pantry, and donate to individuals and families who sign up. 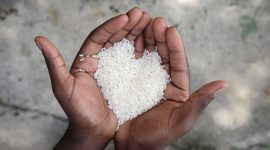 Our volunteers will either collect these items from donors, or donors can finance the purchase of meals. Our fight to end hunger continues, and we are ready for it. The cash donated so far, will go to purchase the first batch of meals. Please sign up with us if you have a need for groceries, if you are hosting a family, if you lost income due to the hurricane, sign up. Again, we thank you and ask you to continue to support our programs.